Tonight we would like to say a very big thank you to the fabulous team at Craft For Paws Fundraising (CFPF) for their absolutely massive donation of goodies that we received just after Christmas. In amongst the huge pile of items were numerous beautiful hand-made crate mats and giant dog beds, mountains of food, boxes of dog shampoo, heat packs, toys, grooming tools and so many other wonderful bits and pieces that will all be put to very good use! These items were a combination of donations from a Christmas giving tree that the CFPF team had organised, along with items made by the CFPF team. We were absolutely blown away with the sheer volume of donations. As you can see in the pic below, the donations filled the car! 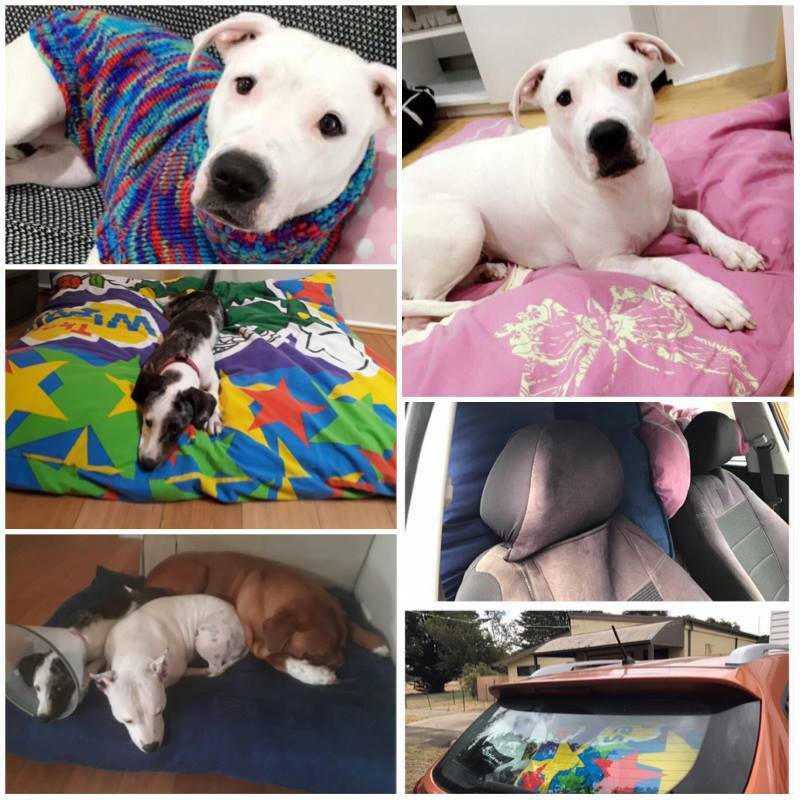 Almost all the items have now been distributed amongst our carers and we wanted to share a few photos of some of our dogs enjoying their beautiful beds. Despite the heat on the day Gyspy received her goodies, she also happily modelled the beautiful hand-knitted jumper she received. Craft For Paws Fundraising is a small but incredibly dedicated group that makes and sells craft items to support rescue. Hear No Evil – Australian Deaf Dog Rescue is one of a small group of rescues that forms part of the CFPF “Sandy Crisp Rescue Support Program” – a program set up in honour of an amazing rescuer who sadly lost her battle with illness last year. The Sandy Crisp Rescue Support Program provides a number of rescues with much needed items such as beds, crate mats, pouches, heat-packs etc. These items are just as essential to the ongoing work of rescue as financial support is and we are so incredibly grateful to have been included by the CFPF team in their Sandy Crisp Rescue Support Program. To show your support for the work these dedicated volunteers do, please head over and join their Facebook group, just Click Here. Here you’ll be able to see all the handmade items they have for sale. If you’re in a position to offer support by donating items that will be used to make beds, etc or other suitable items that will go to rescue, then arrangements for drop-off can be made via the group.